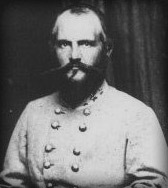 Captain J H Forney, artillery, Confederate States Army, was appointed colonel, 10th Alabama Infantry, on 4 June, 1861, and was assigned to command the Fifth Brigade, Army of the Shenandoah, and all troops at Piedmont Station, Fauquier County, Virginia, by General Orders No.1, Paragraph I, Headquarters, Fifth Brigade, Army of the Shenandoah, on 21 July, 1861. Captain J B Martin, 10th Alabama Infantry, Company G, was appointed lieutenant colonel, 10th Alabama Infantry, on 4 June, 1861. T Bradford was appointed major, 10th Alabama Infantry, on 8 July, 1861, and resigned on 21 August, 1861. The company was accepted in Confederate service at Ashville, St Clair County, Alabama, on 4 June, 1861, and was mustered in Confederate service for the war by Captain J H Forney, artillery, Confederate States Army, dated 4 June, 1861. The company was accepted in Confederate service at Jefferson, Marengo County, Alabama, on 4 June, 1861, and was mustered in Confederate service for the war at Montevallo, Shelby County, Alabama, by Captain J H Forney, artillery, Confederate States Army, dated 4 June, 1861. The company was accepted in Confederate service at Montevallo, Shelby County, Alabama, on 4 June, 1861, and was mustered in Confederate service for the war by Captain J H Forney, artillery, Confederate States Army, dated 4 June, 1861. The company was accepted and mustered in Confederate service for the war at Alexandria, Calhoun County, Alabama, by Captain J H Forney, Confederate States Army, dated 4 June, 1861. The company was ordered to Montgomery, Montgomery County, Alabama, on 18 June, 1861. The company was accepted in Confederate service at Talladega, Talladega County, Alabama, on 4 June, 1861, and was mustered in Confederate service for the war by Captain J H Forney, artillery, Confederate States Army, dated 4 June, 1861. The company was ordered to Montgomery, Montgomery County, Alabama, on 24 June, 1861, and arrived via Selma, Dallas County, Alabama, in the evening on 25 June, 1861. The company was accepted in Confederate service at Cropwell, Shelby County, Alabama, on 4 June, 1861, and was mustered in Confederate service for the war by Captain J H Forney, artillery, Confederate States Army, dated 4 June, 1861. The company was ordered to Montgomery, Montgomery County, Alabama, on 20 June, 1861, and arrived on 22 June, 1861. The company was accepted in Confederate service at Jacksonville, Calhoun County, Alabama, on 4 June, 1861, and was mustered in Confederate service for the war by Captain J H Forney, artillery, Confederate States Army, dated 4 June, 1861. The company was ordered to Montgomery, Montgomery County, Alabama, on 19 June, 1861, and arrived on 22 June, 1861. The company was accepted in Confederate service at Choccolocco, Calhoun County, Alabama, on 4 June, 1861, and was mustered in Confederate service for the war at Montgomery, Montgomery County, Alabama, by Captain J H Forney, artillery, Confederate States Army, dated 4 June, 1861. The company was accepted in Confederate service at DeKalb County, Alabama, on 4 June, 1861, and was ordered to Montgomery, Montgomery County, Alabama, on 21 June, 1861. The company arrived by steamer on the Coosa River at Montgomery, Montgomery County, via Munford, Talladega County, Alabama, on 23 June, 1861, and was mustered in Confederate service for the war by Captain J H Forney, artillery, Confederate States Army, on 26 June, 1861, dated 4 June, 1861. The company was ordered to proceed by the Montgomery & West Point Railroad to Richmond, Henrico County, Virginia, on 30 June, 1861, and arrived by the Richmond & Petersburg Railroad via Augusta, Richmond County, Georgia, and Wilmington, New Hanover County, North Carolina, on 4 July, 1861. The company was accepted in Confederate service at Fayetteville, Talladega County, Alabama, on 4 June, 1861, and was mustered in Confederate service for the war at Montevallo, Shelby County, Alabama, by Captain J H Forney, artillery, Confederate States Army, date 4 June, 1861. The company was ordered to Montgomery, Montgomery County, Alabama, on 24 June, 1861, and arrived on 26 June, 1861. "We paid a visit today to the various encampments in the neighbourhood of the city, and found, among others, Col. Forney's Tenth Regiment of Alabama, a corps of Virginia Artillerists, Mississippi Cavalry, Texas Rangers, Boykin Rangers, and last, though not least, your pets of the Hampton Legion." The 10th Alabama Infantry was accepted in Confederate service and ordered to rendezvous at Montgomery, Montgomery County, Alabama, on 4 June, 1861. Mustered for the war, at the several county rendezvous in Alabama, dated 4 June, 1861: The 10th Alabama Infantry was mustered in Confederate service for the war at the several county rendezvous in Alabama by Captain J H Forney, artillery, Confederate States Army, dated 4 June, 1861. Alexandria, Calhoun County, to Montgomery, Montgomery County, Alabama, Company D, 18 June, 1861: The Alexandria Riflemen was ordered to Montgomery, Montgomery County, Alabama, on 18 June, 1861. Jacksonville, Calhoun County, to Montgomery, Montgomery County, Alabama, Company G, 19-22 June, 1861: The Pope Walker Guards was ordered to Montgomery, Montgomery County, Alabama, on 19 June, 1861, and arrived on 22 June, 1861. Cropwell, Shelby County, to Montgomery, Montgomery County, Alabama, Company F, 20-22 June, 1861: The Coosa Valley Blues was ordered to Montgomery, Montgomery County, Alabama, on 20 June, 1861, and arrived on 22 June, 1861. DeKalb County, to Montgomery, Montgomery County, Alabama, Company I, 21-23 June, 1861: The Yancey or Calhoun Guards was ordered to Montgomery, Montgomery County, Alabama, on 21 June, 1861, and arrived by steamer on the Coosa River via Munford, Talladega County, Alabama, on 23 June, 1861. Talladega, Talladega County, to Montgomery, Montgomery County, Alabama, Company E, 24-25 June, 1861 The Talladega Davis Blues was ordered to Montgomery, Montgomery County, Alabama, on 24 June, 1861, and arrived via Selma, Dallas County, Alabama, in the evening on 25 June, 1861. Fayetteville, Talladega County, to Montgomery, Montgomery County, Alabama, Company K, 24-26 June, 1861 The Fort William Rifles was ordered to Montgomery, Montgomery County, Alabama, on 24 June, 1861, and arrived on 26 June, 1861. Montgomery, Montgomery County, Alabama, to Richmond, Henrico County, Virginia, 27 June-4 July, 1861: The 10th Alabama Infantry was ordered to proceed by the Montgomery & West Point Railroad to Richmond, Henrico County, Virginia, between 27 and 30 June, 1861, and arrived by the Richmond & Petersburg Railroad via Augusta, Richmond County, Georgia; Wilmington, New Hanover County, and Weldon, Halifax County, North Carolina; and Petersburg, Dinwiddie County, Virginia, on 3 and 4 July, 1861. Note: The 10th Alabama Infantry, Company D, was ordered to proceed by the Montgomery & West Point Railroad to Richmond, Henrico County, Virginia, on 28 June, 1861; Company G on 29 June, 1861; and Companies E, F, I, and K on 30 June, 1861. Companies D and G arrived by the Richmond & Petersburg Railroad on 3 July, 1861; Company E at 9 PM on 3 July, 1861; and Companies F, I, and K, on 4 July, 1861. Richmond, Henrico County, to Winchester, Frederick County, Virginia, Companies A, B, C, D, & E, 11-13 July, 1861: The 10th Alabama Infantry, Companies A, B, C, D, and E, were ordered to proceed by the Virginia Central Railroad to Winchester, Frederick County, Virginia, in the evening on 11 July, 1861, and arrived by the Manassas Gap Railroad at Strasburg, Shenandoah County, via Gordonsville, Orange County, and Manassas Junction, Prince William County, Virginia, on 12 July, 1861. Companies A, B, C, D, and E were ordered to proceed by the Valley Turnpike to Winchester, Frederick County, Virginia, in the morning on 13 July, 1861, and arrived in the evening the same day. Richmond, Henrico County, to Winchester, Frederick County, Virginia, Companies F, G, H, I, & K, 11-14 July, 1861: The 10th Alabama Infantry, Companies F, G, H, I, and K, were ordered to proceed by the Virginia Central Railroad to Winchester, Frederick County, Virginia, by Special Orders No.214, Paragraph II, Headquarters, Virginia Forces, Richmond, Henrico County, Virginia, in the evening on 11 July, 1861, dated 7 July, 1861, and arrived by the Manassas Gap Railroad at Strasburg, Shenandoah County, via Gordonsville, Orange County, and Manassas Junction, Prince William County, Virginia, on 13 July, 1861. Companies F, G, H, I, and K were ordered to proceed by the Valley Turnpike to Winchester, Frederick County, Virginia, in the morning on 14 July, 1861, and arrived at Red Bud Run, on the Martinsburg Turnpike, one and a half miles north of Winchester, Frederick County, Virginia, in the evening the same day. Note: The 10th Alabama Infantry was assigned to the Fifth Brigade, Army of the Shenandoah, under the command of Brigadier General E K Smith, Confederates States Army, Red Bud Run, on the Martinsburg Turnpike one and a half miles north of Winchester, Frederick County, Virginia, on 15 July, 1861. The 10th Alabama Infantry was ordered to Manassas Junction, Prince William County, Virginia, by Special Orders No.1, Headquarters, Army of the Shenandoah, Winchester, Frederick County, Virginia, at 1 AM on 18 July, 1861, dated 17 July, 1861. Red Bud Run, on the Martinsburg Turnpike, one & a half miles north of Winchester, Frederick County, to Piedmont Station, Fauquier County, Virginia, 18-19 July, 1861: The 10th Alabama Infantry was ordered to proceed by the Millwood Turnpike to Piedmont Station, Fauquier County, Virginia, at 3 PM on 18 July, 1861, and arrived at Berry's Ferry, on the Shenandoah River, via Millwood, Clarke County, Virginia, at 12 AM on 19 July, 1861. The regiment was ordered across the Shenandoah River at Berry's Ferry, three and a half miles southeast of Millwood, Clarke County, Virginia, at 6 AM the same day and arrived at Piedmont Station via Ashby's Gap and Paris, Fauquier County, Virginia, at 1 PM on 19 July, 1861. Note: Brigadier General E K Smith, Confederates States Army, assumed command of the Fourth Brigade, Army of the Shenandoah, at Piedmont Station, Fauquier County, Virginia, in the morning on 21 July, 1861, and was ordered to proceed by the Manassas Gap Railroad to Manassas Junction, Prince William County, Virginia, at 5 AM the same day (See the Fourth Brigade, Army of the Shenandoah). Piedmont Station, Fauquier County, to Manassas Junction, Prince William County, Virginia, 22 July, 1861: The 10th Alabama Infantry arrived by the Manassas Gap Railroad at Camp Pickens, Manassas Junction, Prince William County, Virginia, at 10 AM on 22 July, 1861. Note: Colonel J H Forney, 10th Alabama Infantry, was assigned to command the Fifth Brigade, Army of the Shenandoah, and all troops stationed at Piedmont Station, Fauquier County, Virginia, by General Orders No.1, Headquarters, Fifth Brigade, Army of the Shenandoah, Piedmont Station, Fauquier County, Virginia, in the morning on 21 July, 1861. Camp Pickens, Manassas Junction, Prince William County, Virginia, to F Lewis' Farm, a quarter of a mile southwest of Lewis' Ford, on the Bull Run River, 22 July, 1861: The 10th Alabama Infantry was ordered to F Lewis' Farm, a quarter of a mile southwest of Lewis' Ford, on the Bull Run River, at 12 PM on 22 July, 1861. F Lewis' Farm, a quarter of a mile southwest of Lewis' Ford, on the Bull Run River, to two half miles northeast of Bristoe Station, & half a mile northeast of the Orange & Alexandria Railroad, Prince William County, Virginia, 4 August, 1861: The 10th Alabama Infantry was ordered two miles northeast of Bristoe Station, and half a mile northeast of the Orange & Alexandria Railroad, Prince William County, Virginia, on 4 August, 1861. Surrendered at Appomattox Courthouse, Appomattox County, Virginia, 9 April, 1865: The 10th Alabama Infantry surrendered at Appomattox Courthouse, Appomattox County, Virginia, on 9 April, 1865. Colonel J H Forney, 10th Alabama Infantry: First Lieutenant J H Forney, 10th United States Infantry, resigned at West Point Military Academy, Orange County, New York, on 9 January, 1861, dated 23 January, 1861, and was appointed special aide to Colonel W H Chase, Florida Militia, on 22 January, 1861. Special Aide J H Forney was appointed colonel, 1st Alabama Artillery, Provisional Army of Alabama, on 7 February, 1861, and was temporarily assigned to command at Pensacola, Escambia County, Florida, between 1 and 11 March, 1861. Colonel J H Forney, 1st Alabama Artillery, Provisional Army of Alabama, was appointed acting inspector general to Brigadier General B Bragg, Confederates States Army, at Pensacola, Escambia County, Florida, between 12 and 31 March, 1861, was appointed captain, artillery, Confederates States Army, on 20 April, 1861, dated 16 March, 1861. Captain J H Forney, artillery, Confederates States Army, was ordered to Montgomery, Montgomery County, Alabama, on 31 May, 1861, and was appointed colonel, 10th Alabama Infantry, on 4 June, 1861. Note: Colonel W H Chase, Florida Militia, was appointed major general, Provisional Army of Florida, on 31 January, 1861, dated 1 March, 1861. The 10th Alabama Infantry was assigned to the Fifth Brigade, Second Corps, Army of the Potomac, under the command of Senior Colonel J H Forney, 10th Alabama Infantry, on 25 September, 1861.